As the next iteration of 3D Assistance, the 3D Printshop at Digital Harbor Foundation is here to serve your 3D printing needs. The shop handles bulk orders, custom jobs, and large print sizes, in most colors and materials. 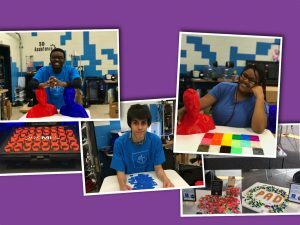 3D Printshop is staffed with youth employees from the Digital Harbor Foundation’s after-school program who have expertise in 3D printing and managed by staff that are nationally recognized experts in the 3D printing community and have been featured speakers on 3D printing and digital fabrication contributors to Make Magazine. The Print Shop not only offers 3D printing and 3D scanning services, they also offer 3D Printers and supplies. They currently sell Flashforge Finder 3D Printers and a variety of Hatchbox filament. Please contact 3D Assistance for your 3D Printing needs!